When Iran Heads To The Polls, A Stark — If Limited — Choice Awaits : The Two-Way President Rouhani's re-election bid has hit a steep challenge from hard-liner Ebrahim Raisi. Though Ayatollah Khamenei will remain supreme leader, the choice still marks a crossroads. Here's a primer. 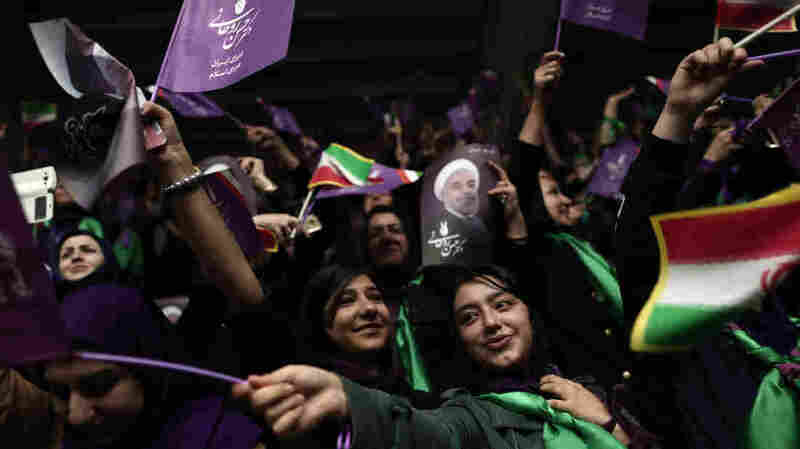 Supporters of Iranian President Hassan Rouhani gather for a campaign rally in Ardabil, Iran, on Wednesday. As Iranian voters prepare to head to the polls Friday, there's one thing the high-stakes presidential election certainly will not decide: the country's commander in chief. That post, at least, is already filled by Ayatollah Ali Khamenei, Iran's supreme leader for nearly three decades. As long as he maintains control over the highest seat in the land, Khamenei enjoys wide-ranging authority over the security forces and effective veto power over matters both diplomatic and domestic — including the council that vets and approves presidential candidates. Still, the presidency offers significant power of its own. Whichever candidate emerges with the electoral victory will be handed a four-year term and the helm of an economy at a crossroads. The approaching election presents a stark choice for Iranians: Re-elect the moderate incumbent, President Hassan Rouhani, or reject his relatively open-facing policies and turn to the conservative hard-liners hoping to replace him, such as his biggest challenger, Ibrahim Raisi. Here is what's at stake in Iran on Friday — from the big names to the way they'll be selected — and what it means for the rest of the world. What does this mean for the West? 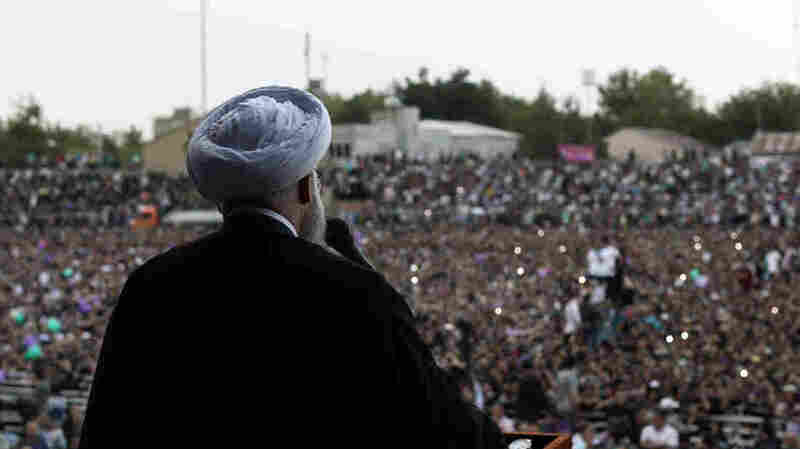 Iranian President Hassan Rouhani speaks to supporters Wednesday at his rally in Ardabil, Iran. 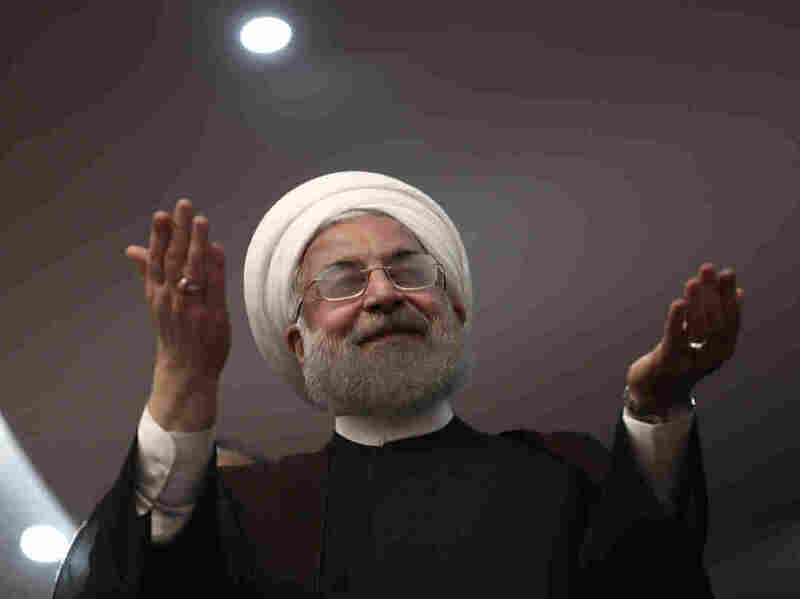 President Hassan Rouhani has been in power since 2013, when he surprised many observers with a commanding electoral victory. Described at the time as "the lone voice of moderation" among the candidates, Rouhani largely confirmed that reputation during his tenure — supporting freer Internet access and holding ground-breaking, regular face-to-face talks with the U.S. about Iran's nuclear program. Those talks resulted in a landmark 2015 agreement that allowed inspectors into Iran's nuclear facilities and promised to limit its nuclear program to peaceful purposes. In return, Iran saw some of the sanctions it had been slapped with lifted. The deal has become the signature achievement of Rouhani's term in office and the centerpiece of his current presidential campaign — for better and for worse. Yet the agreement has delivered mixed results for the Iranian economy. Although the country has attracted big international deals — such as a purchase of Boeing airplanes — the benefits have been slow to trickle down to average Iranians. "A lot of middle-class people here are struggling to make ends meet," NPR's Steve Inskeep reports from the capital, Tehran. "And many of them are frustrated." Ebrahim Raisi's supporters loft national flags and his portrait during a campaign rally at Imam Khomeini Mosque in Tehran on Tuesday. Rouhani blames hard-liners for trying to sabotage the agreement and its benefits, but many of those frustrated voters aren't convinced. They're turning instead to Rouhani's hard-line challengers, most notably Ebrahim Raisi. A conservative cleric, Raisi hews closely to Khamenei's policy line — so much so, in fact, he's occasionally mentioned as the supreme leader's possible successor. 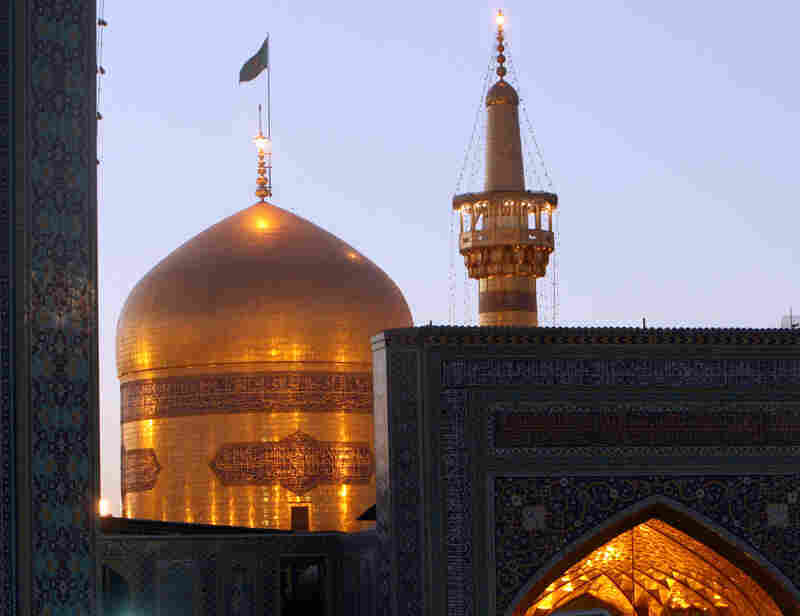 Currently, he helms the charitable foundation for the Imam Reza shrine, one of the focal points of the Shiite world. But many of his detractors look to Raisi's past for perhaps his single most disqualifying factor: his alleged involvement in a committee that decided the fate of thousands of political prisoners who disappeared in the late 1980s. "They executed more than 3,000 political prisoners," Iranian journalist Behdad Bordbar tells NPR's Peter Kenyon. Members of that committee have never faced charges for their role in the presumed killings — but human rights activists aren't prepared to forget. "A man who should be on trial for the most heinous crime in contemporary Iranian history, is instead seeking the presidency," said Hadi Ghaemi, executive director of the Center for Human Rights in Iran, said in a statement last month. "Allowing him to run for president is yet another grievous wound for the families who unjustly lost their loved ones in 1988." Yet Raisi's electoral position was buttressed this week, as one of his rivals — Tehran Mayor Mohammad Bagher Qalibaf, another hard-liner — dropped out of the race and endorsed him. The pair, who accuse Rouhani of anemic economic progress and weakness in negotiations with the West, even campaigned together on Tuesday. Rouhani, for his part, recently received the backing of another dropout, reformist candidate Eshaq Jahangiri. Mostafa Hashemitaba, also a reformer, and conservative Mostafa Mirsalim round out the list of six presidential candidates approved by the Guardian Council, a 12-seat, appointed panel dominated by conservative, religious members. Hashemitaba and Mirsalim qualified for the group of finalists — beating out more than 1,600 others who put their names forward, according to NBC — but neither has appeared to approach the same level of popularity as the two main contenders. In fact, Hashemitaba has been openly calling for his supporters to vote for Rouhani, and Mirsalim has endorsed Raisi. Then again, Iran's elections are often unpredictable (as the section directly below demonstrates), and unofficial polls reflect a race this year that's likely to be no different. 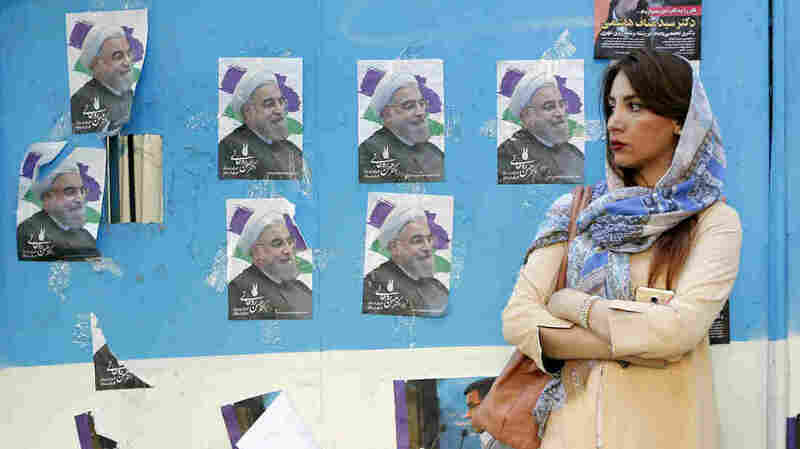 A woman in Tehran stands in front of a wall plastered with posters of Iranian President Hassan Rouhani, whose re-election bid will have its decisive moment Friday — unless, of course, the voting results in a runoff. Voters head to the polls Friday, though if past elections are any indication, it's unlikely we'll know the results before Saturday. Even then, those results might be less than decisive: By Iran's electoral rules, a candidate must earn more than 50 percent of the vote to seal a win in the first round. Otherwise, the top two candidates from the first vote will take part in a runoff one week later, set for May 26. Iran's leaders are bullish about prospective turnout, with the country's interior minister predicting that more than 70 percent — or some 56.4 million people — will vote, according to The Associated Press. "Historically," the news service notes, "the more Iranians who cast ballots, the greater the chance a reformist or a moderate like Rouhani will be elected." But Iranian elections are famous for their surprising results. Not only did Rouhani's victory come as a shock to some, the 1997 election of reformer Mohammad Khatami defied many predictions, as well. But by 2005, voters had grown so dissatisfied with Khatami's perceived failure to deliver on his promises that they surprised observers again — electing a then-relative unknown in hard-line conservative Mahmoud Ahmadinejad. In 2009, even the final official results didn't spell an end to that year's election, which turned into a full-blown crisis and crackdown after Ahmadinejad won again. Hundreds of thousands of Iranians marched and protested, claiming the vote was rigged — but security forces eventually crushed the demonstrations, known as the Green Movement, with waves of arrests of protesters and prominent political figures. Iranian President Hassan Rouhani addresses a crowd in Takhti Stadium in Mashhad, Iran, on Wednesday. Rouhani took power in 2013, surprising many observers with a convincing victory in the first round of voting. With the Middle East in turmoil and traditional alliances in question, the decision Iranians make on Friday could have an impact well beyond their country's borders. Iran's current theocracy, which was born in the 1979 Islamic Revolution, often backs militants around the Middle East — from the Lebanon-based Shiite group Hezbollah to Yemeni rebels. Its clerical leadership has threatened Israel's existence and demonized the U.S.
And Iran's supreme leader is well aware that his country's election has captured the world's attention. "From the U.S. state apparatuses to European powers and regional countries aligned with America, to the pathetic prime minister of the Zionist regime, all are closely watching [the vote] and how and in what spirit" the Iranians will vote, Khamenei said in a televised speech Wednesday, according to the AP. While Khamenei controls Iran's foreign policy, the president can help sculpt broader global opinion about the country's actions on the world stage. That includes the U.S., where Iran-watchers — including members of Congress — are sharply split over how to deal with the country. Although Rouhani won the backing of the ayatollah on the deal to limit Iran's nuclear program, hard-liners in the U.S. tend to distrust Rouhani as the deceptively friendly face of a rogue nation. Others have been won over by Rouhani's willingness to talk to the West, believing Iran might slowly become more moderate if the U.S. and European powers engage with the country economically. For now, President Trump's administration has said it will continue to uphold its end of the nuclear bargain, announcing Wednesday that it would continue to waive some sanctions on Iran despite having referred to the deal on the campaign trail as the "worst deal ever." 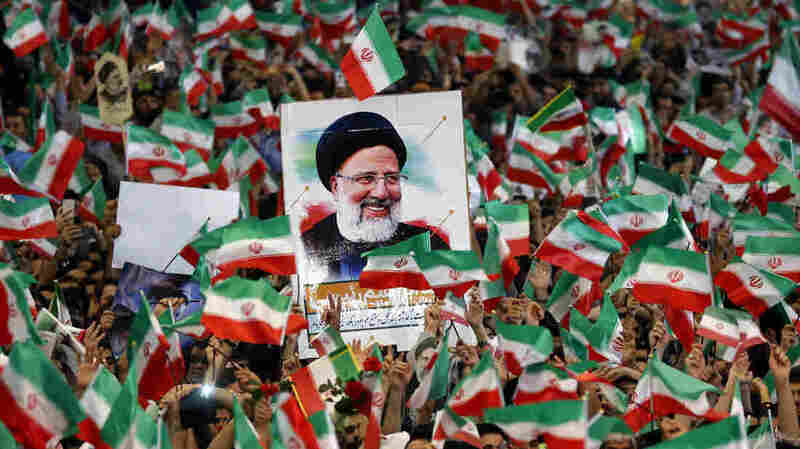 Should Raisi win, however, hawks in the West are likely to increase their calls for tighter sanctions until Iran ends its support for militant groups and its longtime enmity toward Israel. Ultimately though, the Trump administration and Congress appear eager to revise former President Barack Obama's policies toward Iran. That might spell tighter U.S. sanctions either way — in which case, the other signatories on the nuclear, which range from Russia to the U.K., would soon face a decision of their own: Follow the U.S., or continue to work with the man Iranians choose Friday.